Thanks everybody who attended and participated in the second installment of Stylus Sessions. Props to Johnny Juice (Public Enemy), Cutmaster D.C., Lodus (LA), Donnie Dee (TX), Waystyles (WA), Don Santos (TX) Christie Z-Pabon (Tools of War), Marilyn Alonzo, Sondra Chaiken (Premier Artist Group), and hosts DJ Excess (Rock Hard Bastards) and John Carluccio. 1:11:55 – Jam Session: Waystyles, Excess, Lodus, Donnie Dee, Cutmaster DC, Johnny Juice, Don Santos, D.Teknics, and Jago (Dubspot student). Dubspot Original Programming proudly presents the second installment of Stylus Sessions, an open lab for new millennium turntablists to showcase skills and collaborate in a creative noncompetitive environment. 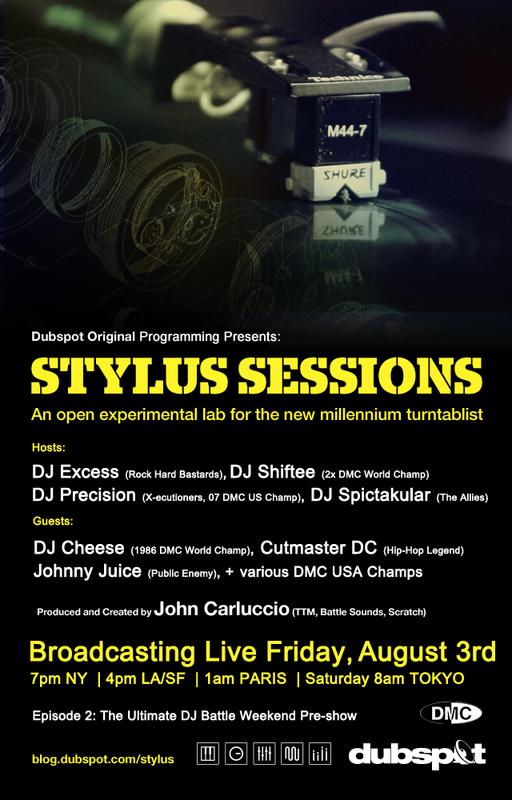 Stylus Sessions 2 will be streaming live on Friday, August 3rd at 7pm, this time featuring DJ Excess (Rock Hard Bastards), DJ Shiftee (2x DMC World Champ), DJ Precision (X-Ecutioners, 07 DMC US Champ), DJ Spictakular (The Allies), and special guests and appearances from DJ Cheese, Cutmaster DC, Johnny Juice, and various DMC USA champs. Produced and created by John Carluccio (TTM, Battle Sounds, Scratch). RSVP on the Facebook event page. This event will be streaming live only. Again, don’t forget to tune in to the live broadcast on Friday, August 3rd at 7pm. In the spirit of the Battle Sounds Turntablist Festival, Tableturns, Future Primitive, SkratchCon, SkratchPad, Skratch Lounge and many more, Stylus Sessions is a noncompetitive testing ground for the evolution of DJing, turntablism and controllerism.